or working in Cambodia. The exhibition will take place November 2007. Neari. The final selection will be made by October 15th. Dear Film Friends and Art Lovers! Born into Brothels, by Ross Kauffman and Zana Briski, is the winner of the 77th annual Academy Award for Best Documentary Feature. A tribute to the resiliency of childhood and the restorative power of art, Born into Brothels is a portrait of several unforgettable children who live in the red light district of Calcutta, where their mothers work as prostitutes. Zana Briski, a New York-based photographer, gives each of the children a camera and teaches them to look at the world with new eyes. Nico Mesterharm’s TV Documentary was filmed in 2001/2002 for the European Cultural Program “ARTE” It shows the work of different NGOs combatting HIV/AIDS – such as the outstanding “Wat Opod Project”: In Takeo province the American Missionary and Vietnam-veteran Wayne Matthysse and Vandin San, a Khmer Buddhist, co-founded the first multi-religious AIDS-Center in Cambodia – located on the temple-grounds of Wat Opod, 45 Kilometer from Phnom Penh. Apocalypse Now is a 1979 Academy and Golden Globe award winning American film set during the Vietnam War. It tells the story of Army Captain Benjamin L. Willard who is sent into the Cambodian jungle to assassinate United States Army Special Forces Colonel Walter E. Kurtz, who is said to have gone insane. The film has been viewed as a journey into the darkness of the human psyche. The film was directed by Francis Ford Coppola and was in large part based on Joseph Conrad’s famous novel Heart of Darkness (1899). PRESENTED BY FLORIANNE WILD, PH.D.
articulate an artistic vision while living life on the edge. © 2007, J Rosette. 638 pages. her recently deceased daughter back to life. on location in New Mexico, USA. word thrown in for good measure. Featuring ethereal vocals and a grinding, edgy humbucker sound! most significant album of the new underground Cambodian rock scene! The indie classic documentary, as seen around the world by millions! NYPD and the University try to shut them down! No speach, but poetry and humour. A fishman, a girl and a handy man, different creatures and a stair… Three different worlds, the phone is ringing. What will occur ? The theaters international festival will occur for its first edition in Phnom Penh, from the first to the 7th of October, with a great present to the people of Siem Reap with a french mim group. The purpose is to create theatrical tours in the whole country. Every year, one province will host this theaters festival of Cambodia during the first week of October. For this time, participants will come from Cambodia, Laos, Burma, Canada and France. 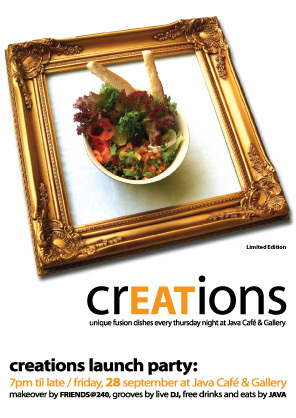 I would like to invite you to an exciting event this Friday at Java Café & Gallery: CREATIONS Launch Party! Celebrating Java’s new chef Nicklas Olsson and his unique fusion cuisine through an edilble exhibition, a food fashion show and live DJ–free eats and drinks all night! You are currently browsing the Sang Salapak Building Arts blog archives for September, 2007. © 2009 Sangsalapak Building Arts. All rights reserved.